Dimensions (HxWxD): 2.5" x 1.65" x 0.2"
This 2.5" Selenite Oval Palm Stone has so much chatoyancy & luminosity it is like bringing the light of the Full Moon into your life! This Selenite Oval has a remarkable ability to reflect even a faint source of light in any room, radiating energy from a bright band across its surface. This Oval comes to you after being cleaned and charged with Universal Life Force energy. It' shape is a slim oval, therefore making it easy to hold in the palm of your hand. Selenite is a form of gypsum, a common mineral composed of calcium sulfate. Gypsum normally is found in sedimentary rock formations, where it forms deposits that can be up to 30 feet thick. The name "gypsum" comes from the Greek word "bypsos" meaning plaster. Gypsum is used today to make plaster and cement. Selenite is the colorless to white colored, translucent variety of gypsum. The name selenite comes from the Greek word "selenites" meaning "moon stone". Selenite exhibits a characteristic brilliant watery reflection on its surface as light changes or one's point of view shifts. This is known to gemologists as "chatoyancy". Coined from the French "chat oeil," meaning "cat's eye," chatoyancy occurs when light is reflected from bands of fibrous inclusions or cavities within the stone, as in cat's eye chrysoberyl. or selenite. Crystal healers say that selenite radiates a vibration of mental clarity, and can be excellent doorways to higher realms, so they can be a point of contact with spiritual guides and teachers, both those in physical bodies at this time and those whose energies are primarily elsewhere. 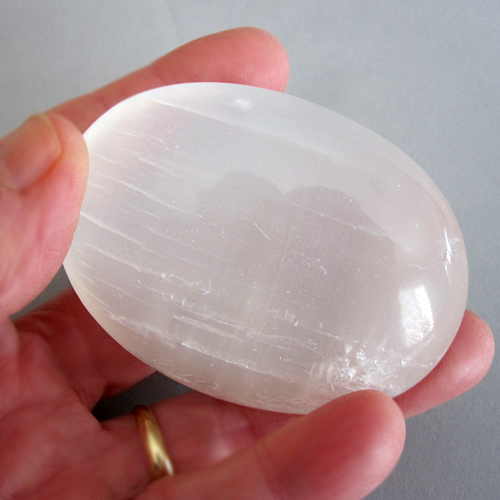 We find Selenite to be a deeply soothing stone, especially when it's been polished as this palm stone is. It is a fine example of Moroccan Selenite, displaying lustre & chatoyancy. The first time i experienced holding Selenite, I immediately found that I could both connect with Divine Guidance, as well as remain grounded & feel my nervous system begin to relax! This selenite oval has been given a Reiki attunement, after being placed in the sun -- and in moonlight -- for additional energizing. It is ready to be placed on an altar or elsewhere in any room to subtly alter the energy in the space. Note: Weight above is shipping weight. Actual Weight is 3.1 ounces! Weight in grams is 87.9 grams! !